Adoption of iOS 10 has surpassed the halfway mark in just two weeks of availability, as research shows more than 55 percent of compatible devices are running Apple's latest mobile operating system. According to statistics compiled by research firm Mixpanel, iOS 10 adoption is tracking at 55.29 percent as of Friday, while iOS 9 stands at 43.8 percent. 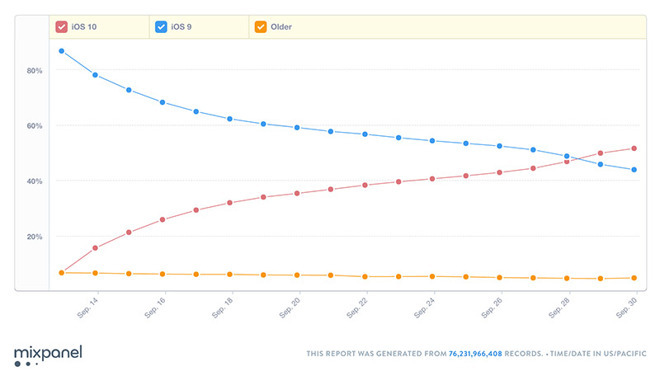 Older iOS version distribution fell to 4.71 percent. The fresh metrics come two days after iOS 10 passed its predecessor for a majority share of compatible devices. Bolstering Mixpanel's numbers, separate findings from AppLovin sees iOS 10 powering 55 percent of iPhones in the U.S., Recode reports. As with any major Apple software release, consumer uptake of iOS 10 has been brisk. Initial figures from Mixpanel put adoption at 14 percent just 24 hours after it debuted earlier this month. A week later the tally showed moderate growth to one-third of compatible devices. Apple has yet to announce official iOS 10 adoption numbers. The company traditionally posts regular updates on version distribution through a developer support webpage, though the resource has not been updated since Sept. 12, the day before iOS 10 launched. Despite the gains, consumers are slower to migrate to iOS 10 than iOS 9, which last year reached the 50 percent mark in only four days. Apple's iOS 10 offers users design enhancements and feature additions to Messages, Maps, Siri, Photos, Apple Music, News, and more. The free update is available now through the Software Update function in the iOS Settings app.